Woot Woot, I finally did it….I finally created Breakfast Egg Muffins that I love to eat!!! Not only are they delicious, but they are easy to make and healthy as well. Don’t worry, I am including instructions for multiple options to create the perfect breakfast on the go not matter what your dietary preferences are! 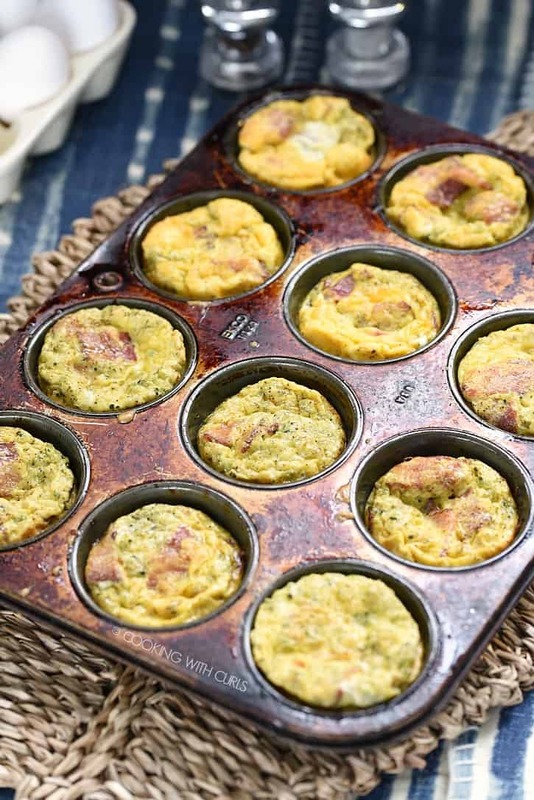 Not only was I looking for a perfectly delicious Breakfast Egg Muffins recipe, I was also looking for an easy way to eat a low-carb meal while running out the door! Most regular breakfast foods do not qualify on Whole30 or Paleo. Preheat oven to 400 degrees. 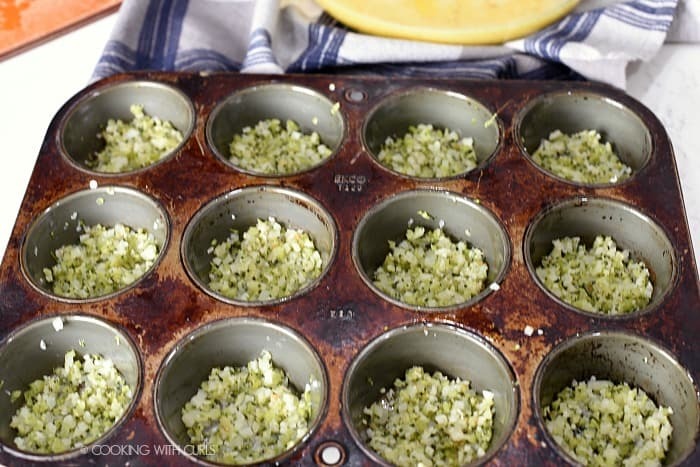 Lightly grease a 12-cup muffin tin with coconut oil or cooking spray. Cook the riced cauliflower and broccoli, covered, in a large non-stick pan over medium-heat for 5 minutes. Divide the cauliflower and broccoli evenly between the muffin cups. Cook bacon in a large skillet, stirring to to cook evenly, until brown and crispy. Drain on paper towels. Divide the cauliflower and broccoli evenly between the muffin cups…..
Sprinkle the bacon pieces over the cauliflower/broccoli mixture…..
Whisk the eggs, milk and seasonings together in a bowl until thoroughly combined…..
Ladle the egg mixture into the muffin tin…..
Bake the egg muffins for 10 to 15 minutes, until set and just starting to turn light brown….. 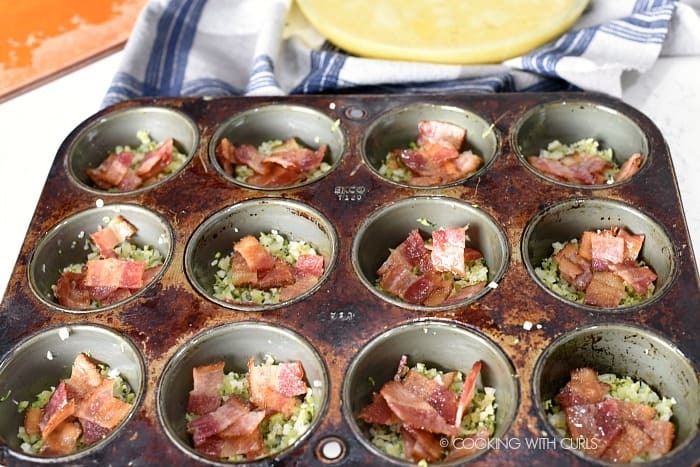 Remove from muffin tin and serve immediately….. 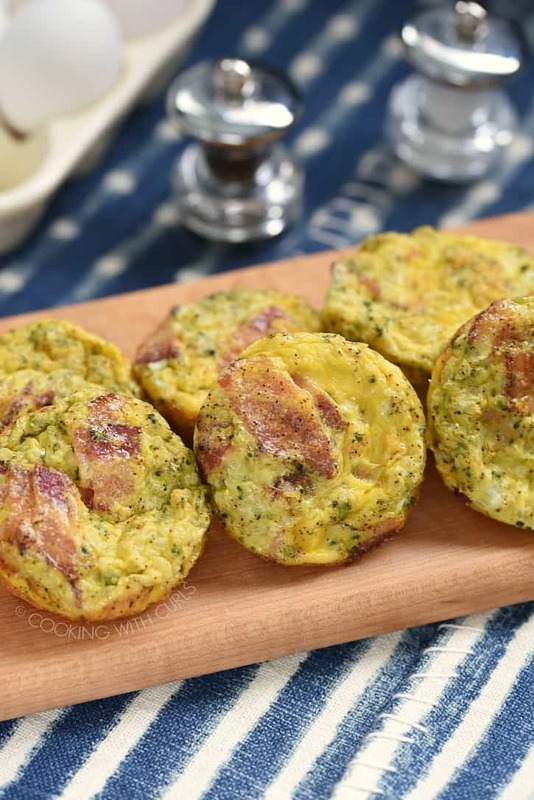 These Breakfast Egg Muffins are addictive, I can’t stop eating them!! I used frozen, riced cauliflower and broccoli to make things super simple. Feel free to make your own if you prefer. You can change up the vegetables however you like; diced bell pepper, mushrooms, onion. You can also change up the seasonings if you like; Italian seasoning, fresh garlic, make it spicier with cayenne, etc. Olive oil will not keep the egg muffins from sticking, trust me!! 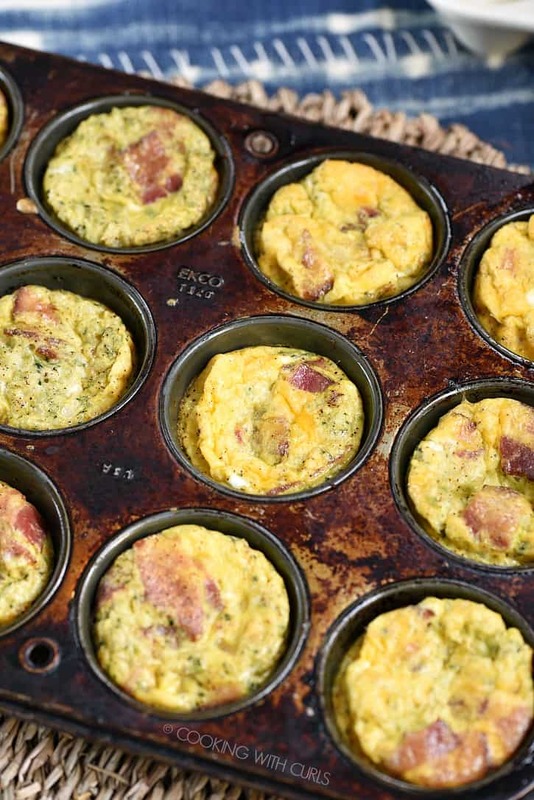 How do you make Whole30 or Paleo Breakfast Egg Muffins? Use full-fat coconut milk from a can, or compliant almond milk. Use coconut oil to grease the muffin tin. How do you make Keto Breakfast Egg Muffins? Use full-fat coconut milk from a can, or heavy cream. Mix a 1/2 cup of shredded cheese, sharp cheddar/Gruyere/etc. into the egg mixture. Sourdough Breakfast Strata – for those who can eat bread and cheese! 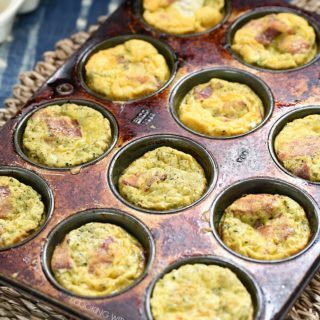 These Breakfast Egg Muffins are an easy and delicious way to eat a low-carb meal while running out the door! Cook bacon in a large skillet, stirring to cook evenly, until brown and crispy. Drain on paper towels. Sprinkle the bacon pieces over the cauliflower/broccoli mixture. 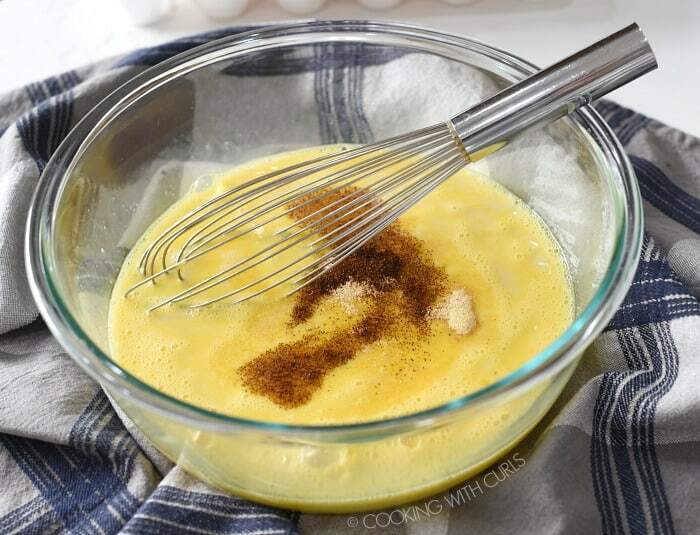 Whisk the eggs, milk and seasonings together in a bowl until thoroughly combined. Ladle the egg mixture into the muffin tin. Bake the egg muffins for 10 to 15 minutes, until set and just starting to turn light brown. Remove from muffin tin and serve immediately. 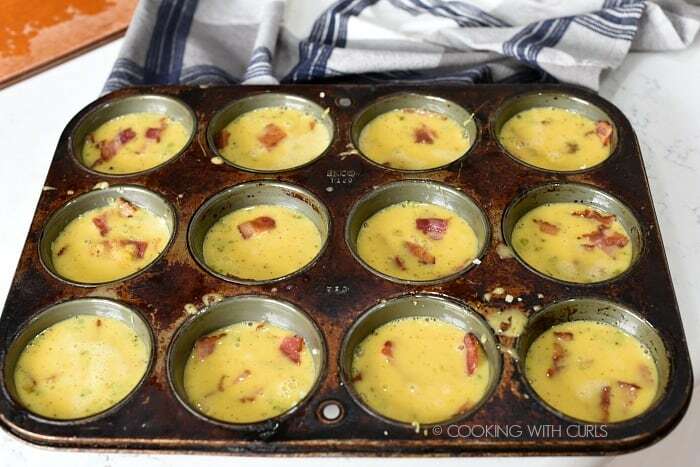 Store cooled egg muffins in the refrigerator and reheat in the microwave as needed. Nutrition facts are based on regular milk and no cheese. Your numbers may be different based on ingredients used.